I can’t even remember a time when I didn’t like the color orange. It’s bright. It’s cheerful. As my favorite color since 2000, it’s actually been the pantone of my century. 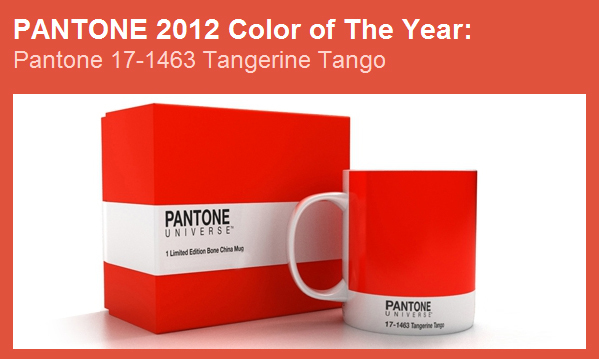 And so, I can’t adequately express how thrilled I am that Pantone has chosen “Tangerine Tango” to be their color of choice to represent 2012. My orange crush is unusually related to my passion for social media. Both have changed my life in such significant ways. For instance, once I realized that my love for orange was something that people recognized me by, almost like my “color mantra,” I made it a part of my identity. It’s a symbol of the positivity we should bring to every situation. And if ever, and these times do happen, I’m feeling frustrated or upset, it’s the honest truth that surrounding myself with orange (and now Pantone 17-1463) somehow gets me out of my funk. Orange has changed the way I approach my work, my friends, and my life. Social media has done the same. It’s not just something I do or even something that I like. It’s a part of how I communicate. It’s a part of how I live. I can’t just read an article anymore and think quietly to myself about it. No, now I read an article and share it to my followers, or my friends automatically see that I’ve read it via Facebook. I don’t just cook food for those who are actually eating it anymore. I cook and share pictures of my delicious dishes with my family and my friends. I don’t save my thoughts about marketing for conversations over cups of coffee (or tea). Instead, I share my ideas with people like you via a blog, twitter, facebook etc. But this isn’t where the similarities end. It’s the energy that our new pantone of the year emits, that makes it so special. A great social media strategy has this same type of energy. It’s a bright light, a great idea, a spot on, amped-with-caffeine approach that makes a social strategy successful. There’s research and thought and PASSION behind every strategic element and that gives a campaign staying power. It gives it that certain “mustafa-genius” that we all, as marketers, strive for. With it’s rich color, the 2012 pantone has a little more depth than other colors. Something that is also especially helpful when implementing a social strategy is a great idea that has “legs.” If a concept has depth to it, a strategy goes beyond assumptions about people’s behaviors and is driven by real human insights, then there’s no limit its virality. Happy Pantone 2012! How has your favorite color shaded your social media interactions? This entry was posted in Just for fun, Social Psyche, Social Strategy and tagged Pantone 2012.